I think that to be mindful when walking, especially in nature - is a good thing to be. That's to say, quietening the chattering brain - so often the source of anguish - baseless worries about the future, mental to-to's, fretting about a past that can't be changed. And instead being fully engaged in the present - fully experiencing everything the senses have to offer. It can, however be frustratingly difficult to quell the nagging and needy "think me!" of thoughts. I've found that a very good thing to focus on is the parallax effect - at least as a gateway to mindfulness. For me it can almost be like a switch - as soon as I key into it - I arrive - in the moment. Everyone will be familiar with it. You see it on a car or train journey - the way the foreground seems to come towards you then whizz by, the middle distance seems to be stationary while things in the distance - hills, clouds move along with you. It can be like the whole scene is on a huge rotating disc. Autumn has been officially inaugurated. It has for me at least. 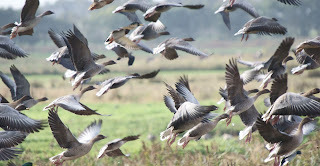 A skein, 110 strong, flew over the patch last Saturday - a fluxating chevron of south-bound Pink-footed Geese. By way of celebrating I produced this track made just from samples (raw or processed) of the patch's autumn birds. The bird species are identified in the comments on the time line. The percussive sounds are made from a Robin 'tick' and a Fieldfare 'chack'. The fluity 'melody', such as it is, is Whooper Swan. I've taken a bit of a liberty calling the Whooper swan a 'patch' birds as I saw 4 flying on one occasion! Brambling, Fieldfare, Redwing, Siskin, Chaffinch, Meadow Pipit, Pied and Grey Wagtails provide flight calls of the kind you might hear on an Autumn morning when migration is taking place.